Valmeinier is a wonderful alpine destination for summer activities. This idyllic resort is comprised of two villages; one set at an altitude of 1500 metres and the other at 1800 metres. When the snow and ice melt under the bright sunshine, a green and hilly alpine landscape is revealed, bursting with colourful flora and fauna. Whatever time of year you decide to visit Valmeinier, our two picturesque properties will be waiting to welcome you. The resort itself is nestled almost exactly on the border between the northern and southern Alps. 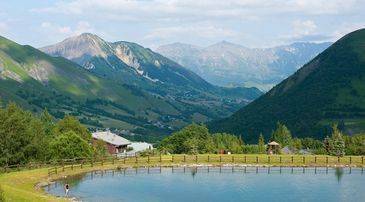 Situated directly at the foot of the magnificent Mount Thabor, Valmeinier can be found in the Savoie department of the Rhones Alpes in south-eastern France, with the well-known resorts of Les Ecrins and La Vanoise. Both of the Madame Vacances' properties in the resort offer guests excellent locations for summer holidays. 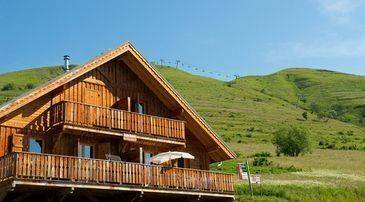 Les Lodges des Pierres is on the slopes of the Galibor Thabor area and Residence Le Vermont is just a short distance from the shops, restaurants and tourist office of the resort. The idyllic setting of Valmeinier in the summer is always popular with outdoor enthusiasts. Keen walkers flock to the resort to make the most of the warm weather and picture perfect views. There are numerous footpaths scattered across the two villages of Valmeinier, many of which are clearly marked with yellow signposts. These hiking routes are labelled on all of the tourist maps in the area and they vary in difficulty, ranging from gentle strolls through the countryside to challenging hikes through rugged mountainous landscape. Take melt undeto the paths alone or arrange a guided walk with a qualified mountaineer, it's up to you. For a really adventurous way to explore the beautiful scenery, join forces with a four legged friend and try cani rando. This involves being harnessed to a husky with a lead strapped around your waist, letting you run, trot or walk as the dog does! Cycling is also a great activity to enjoy while on holiday in Valmeinier. This is no surprise, considering one of the largest cycling areas in the world is located in the nearby Maurienne Valley. In addition to this, many more of the world-famous mountain cycle passes will be almost directly on your doorstep when you stay at a Madame Vacances property. This includes the challenging uphill climbs of the Galibier as well as some more family and beginner-friendly routes. There is a huge climbing wall in the centre of the village of Valmeinier 1500. This is a fun activity, and one which adventurous holidaymakers of all ages can enjoy. Fully-qualified staff are on hand to assist keen climbers during the week, and if you're very prepared, there is free access to the wall for anyone, provided they bring and set up their own equipment. If the climbing wall is not quite high enough for you, then try your hand at the even more daring activity of paragliding. Two-seater paragliding is a wonderful way to soak up the sights of Valmeinier for miles around and is available for both children and adults. Another exciting way to keep children entertained during a summer break in Valmeinier is to visit the treetop adventure park. Kids can roam free and enjoy games as well as exercise in the jungle-like play park, which boasts high-wire zip slides, monkey bars, and ropes to swing on just like Tarzan. For something slightly more leisurely and relaxing, many visitors try fishing for rainbow trout in mountain lakes and streams; the most popular option is the Jeux Lake. However, this is not the only water sport on offer; white water rafting and hydro speeding are favourites with adrenaline junkies. The village of Valmeinier 1800 is home to a selection of relaxed and high-quality restaurants. From pizza to fondue, there are enough eateries of wide variation in the resort that every type of guest, and even the trickiest eaters, will be able to find something to suit them on the menu. Almost every restaurant in the heart of the village is welcoming to families and is also family-run. Rather than French elegance, the typical types of cuisine on offer in the village are hearty and of traditional Savoyard style, served in cosy and laid back environments. Some of the best village restaurants include L'Elan  a snug chalet which provides guests with regional specialities - and L'Estaminet which also focuses of fresh, mountain dishes. Away from the heart of the village, there are also three mountain restaurants in Valmeinier. These are more extravagant options that are ideal for enjoying Alpine dishes with a side of stunning scenery. Le Gros Crey, close to the Petit Dejeuner skiing piste, is an excellent spot to sit on a sun-soaked terrace and eat some delicious local delicacies. Not too far from here, Le Panoramic is a more lavish choice; ideal for romantic meals for two. 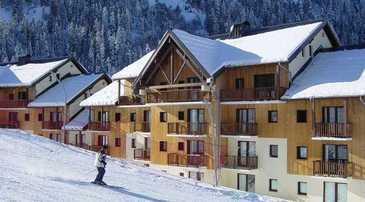 And Les Chalets de l'Armera in the Valloire side of the valley is known for its cosy interior and first class lunches. Nightlife lovers will find a selection of bars in the heart of Valmeinier including No Comment, which provides live music on certain nights and a friendly crowd all summer long. Another option is Les Trois Diables, where the bar stays open until well into the night. There is also a fun filled bowling alley called The Lebowksi. All of these nightlife options are laid-back, and there is only one club in the whole resort: the Brasilia Café. During the summer months, the chair lifts servicing the resort are open from Monday to Thursday. Passes can be purchased online before travelling or at the tourist office of Valmeinier. These passes are divided into children's (age 2-11) or adults (11 plus) and can come in the form of single ascent, four hours, full day, or return journey. Thanks to the friendly atmosphere and many facilities on offer in Valmeinier, the resort is extremely popular with families. Thanks to this, there are many child care services available including the ESF Snow Garden and Club Piou Piou. There are also private babysitting services for hire. Most of the residences in the resort are pedestrian-only zones. However, there are two large car parks located just a five minute walk away from the heart of the village. These car parks and any free parking spaces around the village are marked on all tourist maps with the letter 'P'.